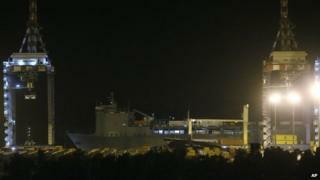 A US ship carrying deadly material from Syria's chemical weapons programme has left Italy in the final phases of the destruction of the arsenal. The naval vessel is taking the cargo, including mustard gas and components of the nerve agents VX and sarin, to international waters to be destroyed. The materials were transferred from a Danish vessel to the US ship earlier on Wednesday, at the port of Gioia Tauro. Syria agreed to the destruction of its chemical weapons stockpile last year. The deal - backed by the UN and brokered by the US and Russia - was struck amid the threat of US air strikes, triggered by a sarin gas attack on a rebel-held suburb of Damascus. The shipment marks the closing phases in the operation to destroy Syria's toxic arsenal. The Danish vessel, Ark Futara, docked on Wednesday morning, carrying the materials and accompanied by Italian coast guard ships and a military helicopter. The transfer of the cargo to the US ship was completed amid tight security, with access roads to the port sealed off. Cranes were seen lifting large containers on to the US navy ship, MV Cape Ray. The US vessel is equipped with a plant where the bulk of the chemicals can be neutralised by the process of hydrolysis. During hydrolysis, the chemical agents are broken down with hot water and then further neutralised with sodium hydroxide - also known as caustic soda or lye. The BBC's Rome correspondent, Alan Johnston, says this process will only begin after the American ship has steamed far out to the sea - because of its hazardous cargo. Any remaining waste is expected to be buried on land, in purpose-built facilities. Italy's Environment Minister, Gian Luca Galletti, said on Twitter that he was proud of his country's "contribution to international security", adding that the operation at Gioia Tauro was transparent and environmentally safe. However, a trade unionist at the port told AFP he was concerned about the transfer. "This is not a routine operation, it's a military operation and we are very worried," Domenico Macri said. "If there's an accident, a container breaks or falls, the substances which would come out could do serious damage," he said. 1. The Syrian authorities are responsible for packing and safely transporting the chemical weapons from 12 sites across the country to the port of Latakia. Russia has supplied large-capacity and armoured lorries, while the US has sent container drums and GPS locators. 2. Russia is providing security for loading operations at Latakia, for which the US has supplied loading, transportation and decontamination equipment. China has sent 10 ambulances and surveillance cameras, and Finland an emergency response team in case of accidents. 3. Denmark and Norway are providing cargo ships and military escorts to take the chemicals to the container port of Gioia Tauro in Italy. Russia and China are also providing naval escorts and the first consignment of 16 tonnes left Latakia on 7 January. 4. In Italy, the "most critical" chemical agents are being loaded onto the US Maritime Administration cargo ship, MV Cape Ray, to be destroyed by hydrolysis in international waters. Less-toxic chemicals will be shipped by Norwegian and Danish vessels for disposal at commercial facilities.